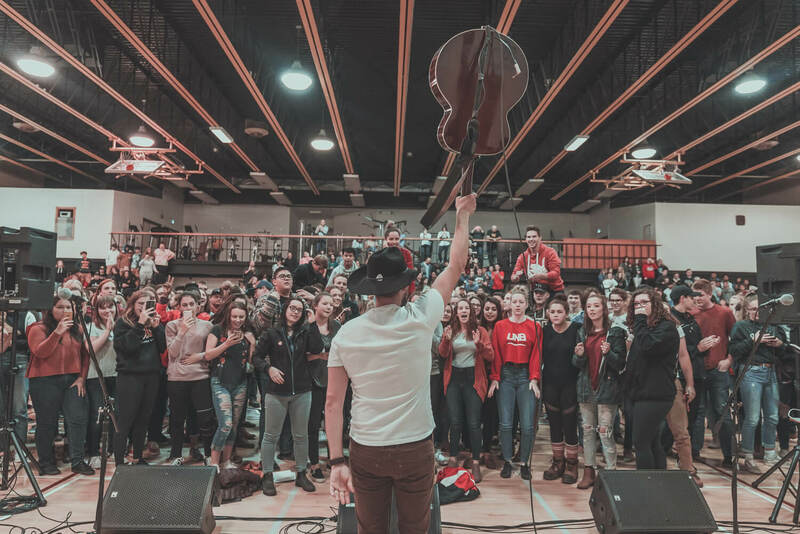 BRETT KISSEL MAKES SURPRISE APPEARANCE at WOODSTOCK HIGH SCHOOL! 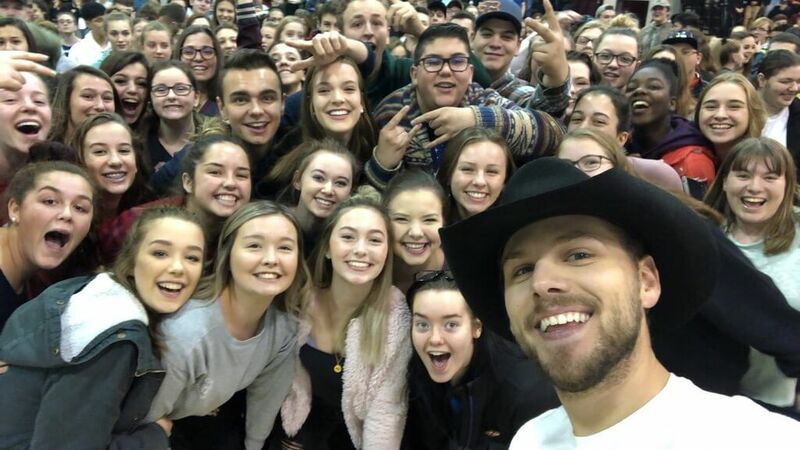 Brett Kissel poses for a selfie with students from Woodstock High School Oct 5/18. This past Friday, October 5th, started like an ordinary school day for students at Woodstock High. However, rather than heading to class at the ringing of first bell, they were instructed to go to the gymnasium. Speculating a mock evacuation exercise; students became especially curious as they entered the gym and discovered a small sound system with three microphones set up. Suddenly a wave of excitement started to fill the room having no idea what was about to happen. Brett has a unique charisma which gives him the ability to easily share and connect with his audience. 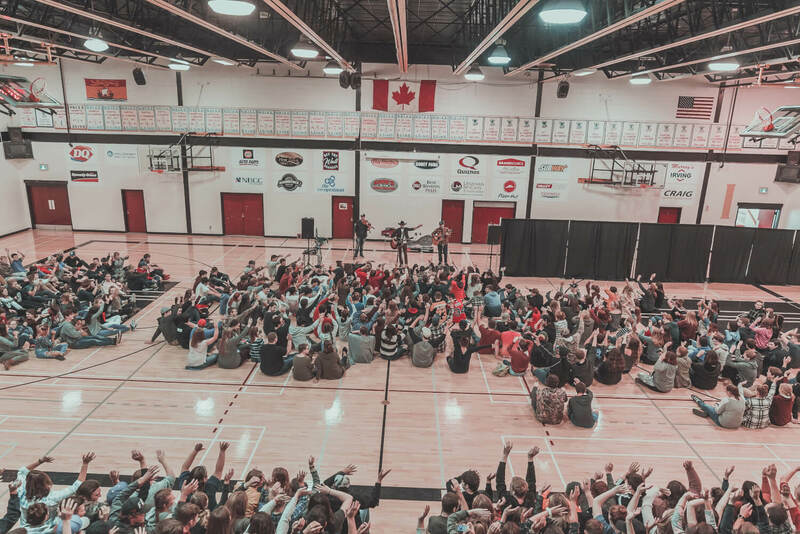 When he learned of recent struggles at the school who is grieving the tragic loss of a grade 12 student, “he wanted to offer some comfort to the group and hopefully lift their spirits, even if just for a short while.” said Kissel’s publicist, Adam Gonshor. WHS Principal Bill Hogan described Brett as an “authentic, genuine, kind, caring person.” He said that during the show, Kissel modified the lyrics of his song “Tough People Do” to include Woodstock High School. Local concert promoter, The East Coast Production Group was happy to help facilitate this surprise appearance and wants to personally thank Mr. Kissel and his Band, Crew, Manager and Agent for making this happen. “The students and staff will remember this moment for the rest of their lives. It’s a memory they’ll look back on and smile each time they think of it. That is what this day was about and for that we are thankful to have played a tiny role.” Said the groups Event Manager, Bobbie O’Donnell. Brett Kissel waves his guitar at WHS Students during a suprise visit to the school. Students enjoying the surprise appearance by Brett Kissel at WHS Oct 5th.